Home » Blog » Which Town in the Algarve Is Right for You? Which Town in the Algarve Is Right for You? Despite the growing popularity of Lisbon and Porto, the Algarve continues to be a popular destination for travelers of all ages and nationalities — including those from Portugal itself. With new hotels, condominiums, and all-inclusive resorts, the Algarve has successfully accommodated the increase in tourism. However, many of the most popular destinations have become more crowded and expensive, to the extent that property values in Lagos and Albufeira now rival those in Lisbon. At the same time, there are a number of quieter and less expensive destinations, and ones for all ages and interests. The increase in travel to the area has led to some destinations becoming more specialized as they cater to a party crowd, to families with young children, or to retirees perhaps looking to put down roots in Portugal. 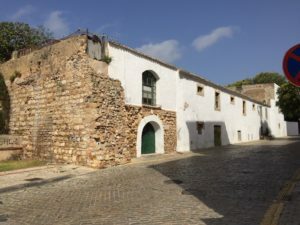 A house built into an old fortification in Faro. I’ve promised readers an in-depth discussion of the different Algarve locations. In putting this together, I’ve researched online sources as well as interviewed about a dozen Portuguese friends and a variety of travelers from the U.S., Canada, and the U.K. who have visited the region in the past few years. I also have my own experience to draw on, though my preference for urban areas and historical sites makes me a bit of an outlier. If you’re looking for a wild party… Albufeira draws the crowds, the energy, and the young travelers, with bars close to the hotels and the beach. This is a good place for your bachelor party, aka stag do, your post-graduation celebration, or to meet other young singles. It’s more expensive than many other locations, but good parties do cost more. The train to Faro stops in Albufeira, making it easy to get to, and plentiful car-rental companies make it easy to get around. If you’re looking for action, but not too crazy… Lagos is the other long-standing tourist city in the region. It’s harder to get to than Albufeira by train, requiring a transfer in Tunes. However, a lot of people rent a car either in Lisbon and drive to the Algarve, or rent in Albufeira and drive the 45 minutes to Lagos. In Lagos, the beach and downtown are separated by a couple of kilometers, so the party action is more dispersed, and it’s possible for families and older travelers to avoid the bar scene altogether. If you like crowds, good restaurants, shopping, and other activities, you’ll find everything you need in Lagos. 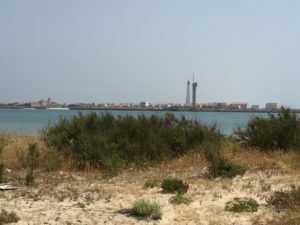 A few kilometers to the east of Lagos is Portimão, another touristic center known for family resorts. If you’re looking for a specialized experience, whether it’s gourmet food, a private beach, a golf course, or children’s activities… check out the resorts that cluster between Sagres and Faro. Two restaurants in the Algarve boast two Michelin stars, and both are connected to resorts, one in Porches (between Lagos and Albufeira) and the other closer to Albufeira but away from the bars. For beaches, the ones between Sagres and Lagos in the western Algarve tend to have more wind and cooler water, a pleasant choice in the summer heat but less so in shoulder season (and a bit cheaper for that reason). This area is also near a large national park, and tours are available. Between Lagos and Albufeira in the central Algarve are a number of family resorts with private beaches and children’s programs. Nearby in Lagoa, a town slightly inland from the beaches, is a large, popular water park. Quinta do Lago is the site of a top-rated golf resort, but there are a number of other well-regarded golf courses in the central Algarve. If you want a high-end experience… Vilamoura, Quinta do Lago, and Vale do Lobo, between Albufeira and Faro, feature the most expensive and elegant hotels, apartment-hotels, and all-inclusive resorts. Ilha Deserta, with Isla Farol in the background. Part of the Ria Formosa nature reserve. If you’re a nature lover… between Sagres and Praia da Luz is one of Portugal’s largest national parks. And from Quinta do Lago eastward, past Faro, Olhão, and Tavira to Cacela Velha is the Ria Formosa Natural Park, an enormous and impressive coastal wildlife preserve. If you love history… Faro is a city with a long history, as evident in its centuries-old architecture, houses built into old fortresses, and a chapel of bones that also contains the graves of the city’s prominent families of the eighteenth and nineteenth centuries. Though not known for its beaches — if you stay in the city, you’ll have to settle for the hotel pool — Faro has musical performances and art exhibits, many of them sponsored by the University of the Algarve located in the city. Faro is also the embarkation point for many of the Ria Formosa boat tours. If you like to shop… Faro, Albufeira, and Lagos are shopping destinations for people who stay out of town as well as those in town. That’s especially the case for Faro, which has a large shopping district, the rail terminal, and the airport, and very few vacationers who actually stay in the city. If you’re on a budget… the eastern Algarve, from Faro to the border with Spain, is generally cheaper than the more heavily visited central Algarve. Also, consider staying in towns away from the beach, because the price of accommodations drops off quickly the farther from the beach you are. Towns in the foothills and mountains of the Algarve, such as Silves, feature beautiful natural scenery and local architecture. They have fewer international tourists, but enough travelers (many of them from within Portugal) to support restaurants and other amenities. If you want quiet… Olhão, Tavira, and other towns in the eastern Algarve tend to attract older travelers. They’re mainly fishing villages, and fresh fish, grilled with butter and lemon, is always on the menu. Tavira has become a favorite location for expats from the U.K. and the U.S. who are buying homes or renting long-term. Many of these are retirees, but political instability (Brexit and Trump) has brought more, and younger, buyers to the area. These towns are serene places to visit and settle, but those wanting more action may want to look elsewhere. In fact, on my river trip along the Douro, I met a group of middle-aged men and women from a sporting club in Olhão. When I told my friends from Porto about their cross-country trip, one friend said, “That’s because there’s nothing to do in Olhão.” Besides Tavira and Olhão, visitors to the eastern Algarve recommend Manta Rota, with its large beach area, and Vila Real de Santo António. Manta Rota’s beach tends to draw more visitors in high season, so June is the best time to go for both quiet and great weather. Vila Real de Santo António, next to the border with Spain, is the eastern terminus of a small railroad line that runs through Faro to Lagos. You may note that I don’t recommend specific resorts, restaurants, or car rental companies. That’s because offerings change, and the best place to look for ratings and reviews are sites such as Trip Advisor that aggregate the experiences of hundreds of visitors, as well as specialized guides such as Michelin for top-rated restaurants. This roundup, though, will help you decide where to go, and when looking at the ratings sites, know if the people writing in have the same goals and priorities that you do. Happy travels! A fantastic roundup, Lyn. Thank you so much! Thank you for reading! I hope you find the right town for you and Andreas! Excellent, Lyn! The travel book publishers should come to you! You’re so knowledgeable! Wow…just found your site today. Great info. We’re flying into Faro on August 22 for 2-3 days. We’re older (70+) and not looking for the party scene. Faro seems just fine. And we’re interested in taking the local train (www.cp.pt) to visit other cities along the Algarve. But, more reasonable lodging outside of town seems to require a car to get there. Haven’t been able to sort out best choices. Pay more and stay closer to town, or reserve a car and drive to other towns. Appreciate your thoughts. Good question! If you stay outside of Faro, you’ll have to figure in the daily price of the rental car. Having a car will give you more flexibility in the towns you’ll be able to visit, but the trade-off is the hassle of driving and parking during high season. If you want to visit inland towns, the bus is another option. Both trains and buses run frequently during the busy summer months. Given that you’re only going to be in Faro for 2-3 days, I recommend staying in the more central location, unless you’re also traveling to, say, Evora and would need to rent the car anyway. There’s so much to do in Faro itself!